Just two games to go, and the IPL's finish line is within licking distance (I don't know what happens at the end, I've never won a major race). It won't seem that way for the Delhi Daredevils, though. They first have to knock out the Chennai Super Kings (the resurgent defending champions), only to then face a team that just defeated them. Fortunately for Delhi, they have rarely had two bad games in a row this season. And unfortunately for them, they now have to have two very good ones back to back, and both in Chennai. Despite the bowling performance against KKR, theirs is still the right combination to go in with. Pawan Negi is handling the lone spinner's position well, and Delhi's only other options in that department are other left-arm spinners Shahbaz Nadeem and ROFLMAO van der Merwe (I may have got something wrong in that sentence). Their pace attack also seems like the type that will rattle the CSK line-up as long as they don't dish up too much filth - which, to their credit, they haven't been doing. Their real problem will be in the batting department. It was terribly unlucky for them to lose both Warner and Sehwag in the space of two balls against KKR (one to an awful umpiring decision, the other to an awful shot). 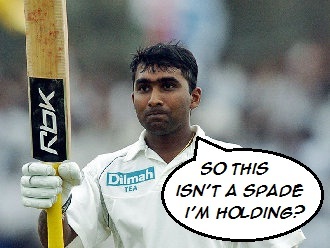 The middle order is severely low on confidence, most notably Mahela Jayawardene. He's two different batsmen in limited-overs cricket - a free-flowing attack-minded opening batsman who makes hundreds, or a scratchy middle-order batsman who makes slow 25s. LRPL Taylor, who had fewer runs than initials for most of the IPL, looks much more comfortable now. He will need to come in earlier though, not as a fourth gear once Mahela, Venugopal Rao and Pawan Negi have dug themselves into a hole. Best XI: Sehwag (c), Warner, Jayawardene, N Ojha (wk), Taylor, Rao, I Pathan, Negi, M Morkel, Yadav, Aaron. They look like champions again. It was inevitable, really. We only have RCB to blame for imploding spectacularly, and the Mumbai Indians for... well, for being the Mumbai Indians. It's no coincidence that Dhoni's form had something to do with it. Last year, he slammed a huge six off Irfan Pathan to take his side forward. The other night, he slammed another left-arm seamer (Franklin) for the longest six of the tournament to take his side into this virtual semifinal. They will only really be bothered about two of their top three batsmen - Vijay has not taken off at all this season and Raina hasn't made a single half-century. Even a hobbling Adam Gilchrist managed one of those, and he had to take a pill just to get his bat up. He has literally been very flat this season. Best XI: M Hussey, Badrinath, Raina, Bravo, Dhoni (c)(wk), A Morkel, S Anirudha, Jadeja, Ashwin, Hilfenhaus, Jakati. Morne Morkel vs Albie Morkel: Because sibling rivalry is always fun. If Delhi wins, it's Irfan vs Yusuf in the final. Hilfenhaus vs Sehwag: Sehwag has a weakness for those quality outswingers Hilfy bowls. I'm backing the bowler. Raina vs Delhi's pace attack: Short stuff is definitely heading his way. And by short stuff, I don't mean Parthiv Patel (but that would be fun, right? ).